I've always been intrigued by the offerings of the Asian beauty market but I've never really known where to start. Now that more products are making their way over, I thought I'd take the opportunity to try out a few highly recommended products and see what I'm missing. The most accessible product is probably the Shu Uemura S Curlers. They are a little twist on the traditional eyelash curler shape to make sure each lash can be curled equally. They're around half the size of your standard curler which makes getting into those tricky corners much easier and achieving much better results. Aside from eye products, one thing I've noticed about the Asian beauty market is the focus on removing blackheads. The Cosrx Blackhead Silk Finger Balls are a product from Korea which are basically 100% natural silk cocoons which you place on your index finger to gently exfoliate on congested areas. They're a great alternative to harsh scrubs and help to smooth out rough textures but they're not the most pleasant smelling of products! You can find them on Cult Beauty, however much cheaper via Ebay if you don't mind waiting a few weeks for arrival. Again with the focus on blackheads I was intrigued by the Pilaten Blackhead Pore Strips. 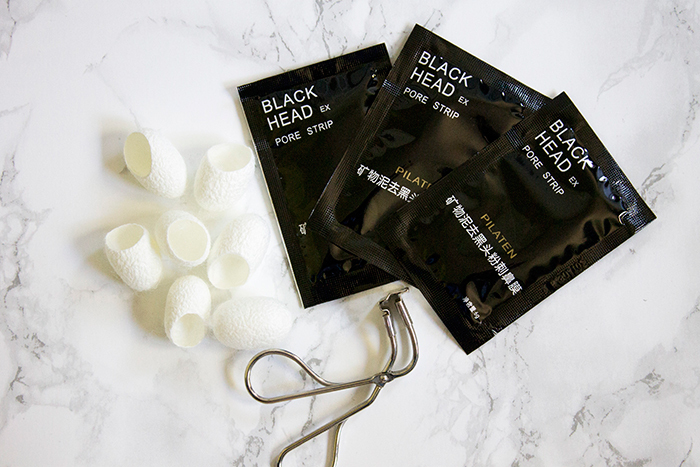 This is basically a peel-off face mask which helps remove those stubborn blackheads with it's thick black formula. The pictures online are slightly misleading on how effective it is in my opinion but it certainly removes far more than any other face mask I've tried and your face feels so smooth afterwards. Plus a pack of ten only cost £1.38! So there you go, my first foray into Asian beauty products. Overall I found the experience really positive and I was surprised by how affordable most products were. Ebay does seem to be the easiest way to find these products but I would suggest making sure you read reviews before you buy! If you have any further recommendations, please leave them in the comments below!